What would you do for a can of Chicken Noodle Soup????? You probably would not have to do much to get a can of Campbell's deliciousness, aside from get in your car, drive to the store, and pick one up. Today my church did something that no other church I have ever been to has ever done. We sang the songs, we took the offering, we had an amazing time of worship that was all about stewardship of life. The sermon had three main points of a faithful steward. A faithful steward is humble, puts their hope and trust in God, and does good deeds (I Timothy 6:17-18). Then after the 10 minute sermon, my pastor instructed everyone to get up and leave and go to Publix(our local grocery) to buy long life shelf items that were on a list handed out at the door. We were instructed that there would be trucks out side waiting to collect the food to take to a local charity organization that hands out groceries to people too poor to buy their own. I have never seen generosity displayed more plainly. I have never seen a sermon lived out like that. It made me want to do more that just Chicken Noodle Soup. Lions, and Tigers, and Bears Oh My! I mean Lions, Elephants, and Rhino's oh my! Here are some pictures of the paintings I did for William Jackson Cockrell, or Jackson William Cockrell. I'm not sure of the order of his name, but I know when he arrives in a month he will go by Jackson. His dear, sweet mom, Becky, requested these and they were ever so much fun to do! 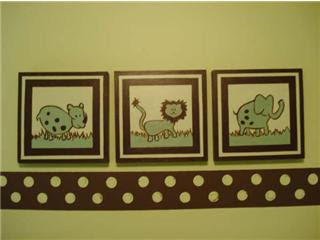 I was quite pleased with the end result and I think that they look adorable in the nursery! I read an article this weekend written by a Christian man who along with his family decided to do their part in being good stewards of the gifts that God had given them; including their time, energy, their tiny part of the environment, their finances and so on. To do this they chose to make some sacrifices, one of which was to give up using a tumble dryer. Instead of drying load after load of laundry in the dryer using unnecessary energy this family chose to use a clothes line, better known to my sweetie as a whirly gig! Strange thought I know, but I remember when my mother almost exclusively using a close line to dry clothes. I used to like to run in between the sheets, because it was like a fort! Then todays message at church was on stewardship. Using the gifts that God has given to bring Him glory. But before I do all that, I must go finish the laundry! So nearly a week and only four comments. Does that mean that only four people read it, or most people don't take the time to read? I think the first one probably. Anywho, I'm going to post them anyway, b/c it's Saturday and I have time to. I'm a bit under the weather today, i actually left work early. Kev made me soup...except he didn't know that it was condensed and served me very thick tomato soup. It was a little bit like tomato paste! My ears are clogged, my nose is running...I've had better days. I thought that I should let everyone know that I have been painting quite a bit. Last week I did 3 paintings for my friends baby's room(I can't show you these b/c I shipped them before I photographed them), and I'm scheduled to paint a little girl's room this week. The cake topper was that last night after two years of despising the paintings I did for over our bed I decided to redo them. Chocolate brown is an effective color and I am quite happy with decision I made to paint over the old and create something new. I would show you but I have been wondering, since I have been neglecting my blog, if ALL my faithful readers have too! If you wish to see my simple master pieces leave me a comment. I plan on waiting until I have 5 comments by 5 different people before posting photos of the new over the bed decorations! I found a jar of old Christmas M & M's in my cupboard today. I decided to shake them like a rattling instrument. I sang a song about them, while shaking them, to try to distract Mr. Jones from his robot work. He didn't notice until the top flew off and M & M's showered the living room. He said it was mildly amusing. And laughed ever so hard at myself for a long time. Mr. Jones just grinned with unjust satisfaction. We cleaned them up together. I'm living life out of my control, wondering if tears are my form of praise, holding my freedom flower, loving the one meant for me, and standing amazed at the One behind it all. Recipe Site...oh to be this good!